THOSE OF US WHO WILL NEVER FORGET. A lot of people are praying for your safe return even though the prospects are very grim. The truth will come out in the end. Rest in Peace Angel!!! are with you Caylee. Be at peace. 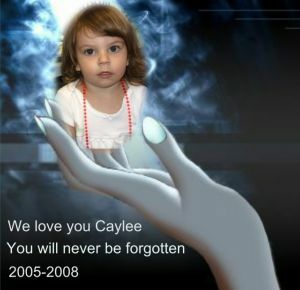 May you rest in peace dear Caylee. May you dance amongst the stars. It's all about you Caylee. May you rest in peace and may you always be that bright shinning star, no matter where you are. Love and much peace. time and time again. I love you little one. should. You were taken from this realm at such a young age. And you will be missed and never forgotten. Justice does need to be in this case. I am so angry at all the deals being made in this sweet babies name. God forbid. Life is so short and you have certainly proved it. I am sorry you had to go through all that you did. But God loves you dearly. He has a much better plan this time around. Lots of hugs and love sweet Caylee. Thank You so much for wanting to use it. I care so much about her....even though I don't know her personally. My THOUGHTS AND PRAYERS ARE WITH HER AND HER ALONE, NOT WITH THE FAMILY AND NOT WITH CASEY.